Daddycakes! Martin and Sylvia love Daddycakes, the inventive creation of their much-loved Daddy. Now I have to admit: Daddycakes are often totally inspired by the moment, as well as what’s in the fridge. So we’ve created an easy, customizable version that’s based on Daddy’s creative pancakes (as well as the pancakes that David has been whipping up in our house for years now). Our version is packed with nut and seed protein as well as a little bit of vegetable goodness. We use the prepackaged squash or sweet potato that you can buy in the frozen section — we steam half a cup before we get started. Daddycakes taste a bit heartier than traditional pancakes, but just a bit! They are sweet and good. You’ll need a food processor, as well as a basic pancake recipe or mix, to get you started. Then you just add those very special ingredients that make Daddycakes unique! Using the food processor, process the nuts and seeds until they are well ground into a heavy “flour” (but not so long that they become nut butter). Prepare the pancake mix (or recipe) by the normal instructions, using the normal proportions. Before combining the wet ingredients with the dry ingredients, add the nut-and-seed meal into the dry ingredients and blend well. To the wet ingredients, add the sweet potato, banana, and extra egg, and use a hand mixer to combine thoroughly. Next, combine both wet and dry ingredients thoroughly. This is your Daddycakes batter! Heat a skillet or pan with butter or oil to coat, and when the pan is hot add ½ cup of batter, tilting the pan to help the batter spread evenly. (The batter is a bit thicker than traditional batter, so it needs a bit of help spreading out across the pan.) Cook on the first side until the up-side is bubbling and the down-side is golden, and then turn, flip, and cook on the opposite side until golden. 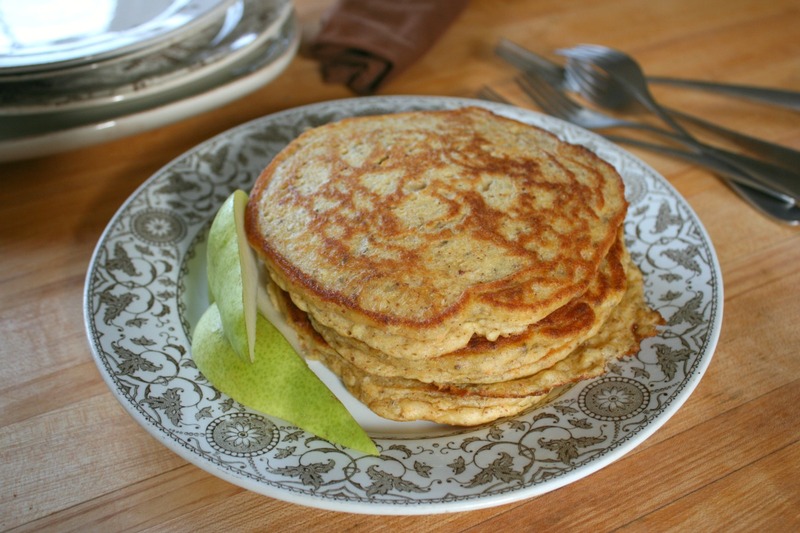 Serve with applesauce (Momma’s Spiced Applesauce!) or maple syrup and fresh fruit.